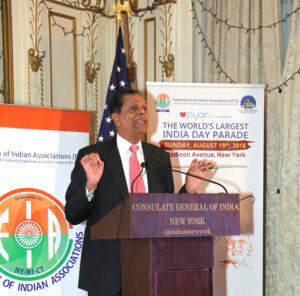 NEW YORK – The 38th India Day Parade, sponsored by the Federation of Indian Associations (FIA-NY/NJ/CT), will be held on Sunday, August 19, in New York City, starting at the corner of 38th Street and Madison Avenue, to commemorate the 72nd Independence Day of India. 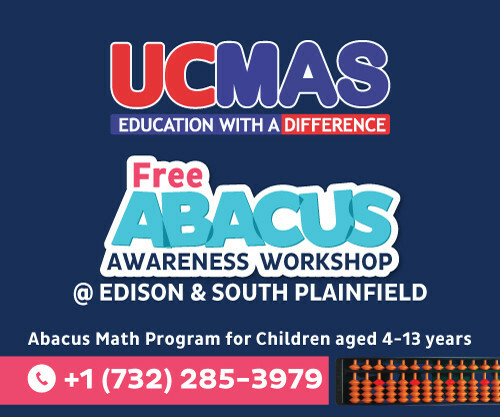 “With keeping our theme in mind, we thank UNISEF USA, who will be joining us in this year’s parade to support the Indian American diaspora, community and the world’s children. The FIA team is working very hard to make this the best year ever,” Srujal Parikh, president of FIA-NY/NJ/CT, said at the curtain raiser, which was held at the Consulate General of India in New York on June 28. Those present at the curtain raiser included Padma Shri Dr. Sudhir Parikh, founder and chairman of Parikh Worldwide Media, along with Consul General of India in New York, Sandeep Chakravorty, Chairman of FIA-NY/NJ/CT Ramesh Patel, Padma Shri H.R. 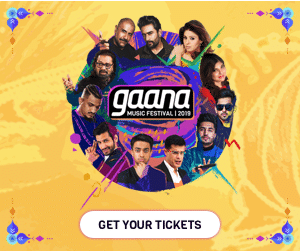 Shah of TV Asia, Chairman of Amneal Pharmaceuticals and community grand marshal Chintu Patel, actress Pooja Kumar and Stacey from Ripley’s Believe It or Not, among others. “India Day Parade is 38-years-old. Imagine our relationship with the United States 38 years ago or even the size of our community and look at where we are today. I think that there is a world of difference and I think the India Day Parade should reflect that difference; the strength, vibrancy and diversity of our community as well as the role it has been playing in the U.S.,” said Chakravorty, adding how honored he is to serve at least half of the Indian Diaspora in the U.S.
“It gives me immense pleasure to be a part of this annual event which not only promotes India but ensures that the roots of our motherland stay strong within the growing diaspora in the United States,” said Dr. Parikh, who also mentioned that the India Day Parade in New York is the largest outside of India while it brings everyone closer to India and exposes India in the eyes of other Americans. 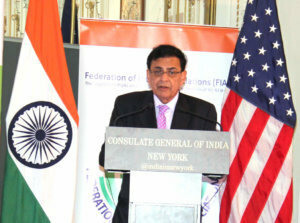 “As the coverage of the parade has grown over the years, so have the bilateral relations between India and the U.S. and the India Day Parade has helped in doing so,” Dr. Parikh added, hoping that this year’s parade will be bigger and better than ever before, reaching an attendance of up to 100,000 people. Others who spoke at the curtain raiser included, Chairman of FIA-NY/NJ/CT Ramesh Patel, and Chairman of Amneal Pharmaceuticals Chintu Patel. The curtain raiser ended with a dance performance showcasing popular dances of India.